Spring has arrived at Victoria Care Home and it has certainly boosted the spirits of the Residents. 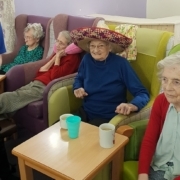 This month they have enjoyed a number of in house activities including a crafts day in preparation for Easter and a visit from The Cheeky Charlies music band! 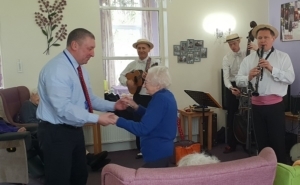 A number of the Residents were up dancing the night away, whilst listening to a number of their favourite songs. Some others took the opportunity to sit back and relax in a cheerful environment with friends. Those who prefer a little bit of quiet time and chit chat enjoyed designing the Easter decorations for the home. All in all it has been a splendid start to Spring for the Residents of Victoria Care Home. https://www.venturihealthcare.co.uk/victoria/wp-content/uploads/sites/5/2018/09/victoria-300-81.png 0 0 Jenna Bethell https://www.venturihealthcare.co.uk/victoria/wp-content/uploads/sites/5/2018/09/victoria-300-81.png Jenna Bethell2019-03-29 16:00:092019-03-29 16:00:13Spring is here! Residents of Victoria Care Home enjoy a host of specialist activities to ensure they are staying active and to promote healthy living as this has been proven to have a significant impact on long term health benefits. Regular exercise and meaningful activities are key to the positive feedback we receive from both family members and the Residents of Victoria and encourages the person centred care approach that is adopted throughout the Venturi Healthcare. A number of Residents particularly enjoy the exercise classes that are scheduled to take place within the comfort of their own home, at Victoria. The exercise classes are orientated around the residents mobility, cognition and over all physical and emotional well being to ensure each class is practicable, fun and stimulating. After taking part in warm up exercises the residents get busy with various apparatus to support their exercises. 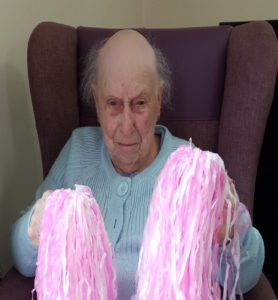 For the most recent exercise class, the Residents took out their pom poms and did some chair based activities. 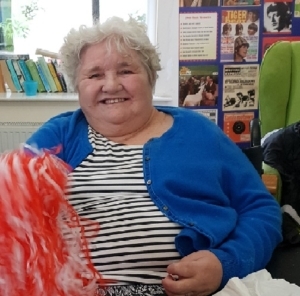 The Residents who are more mobile were also able to take part in this class and had a little dance with the pom poms! Living life to the full should not have to stop just because you have moved in to the care home environment, it important residents stay engaged and enjoy life to the maximum.